Tsubaki "V" Class roller chains are designed and manufactured for oil well rig drives used in the most severe conditions where high speed and heavy shock load are expected. 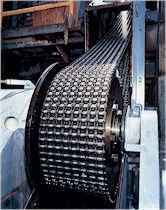 These chains are manufactured according to ANSI specifications. The pin surface is carburized and hardened with Tsubaki heat-treating techniques for superior impact resistance. This results in greater breaking strength and increased chain impact strength as compared to ANSI standard chains. Pin holes in link plates are ball drifted after heat-treatment for greater fatigue strength. A 30% increase in chain life compared with ANSI standard chains is the net result of this procedure. Rollers, precisely manufactured, are shot-peened after heat-treatment to give them superior fatigue life and high speed durability. Tsubaki is certified with the American Petroleum Insititute under license no. 7F-0019.